I bought my Aragon 200W amp and preamp from Ring Audio about 30 years ago when they were located on Queen Street West. After decades of wonderful performance (with my B&W DM6 speakers) the amp ceased working, and it's way too heavy for me (a senior citizen) to bring it in for repairs. Fortunately Ring Audio is still around, and Ted came to the rescue: he came to my home, picked up the equipment, and in surprisingly short order repaired it, brought it back here and reinstalled it. Thank you, Ted, for restoring great-sounding music to our home! We've been satisfied Silvan customers for many years. With great professionalism and reliability, they installed and have mainstined our furnace and the wonderful under-floor radiant heating system in our kitchen. This past New Year's Eve I noticed something was amiss with the furnace, as our house was slowly losing heat. We called Tony who reassured us he'd be here the next day - New Year's day! It turned out to be a pump that needed replacement and Tony and co. took care of it promptly. Everything's working fine and thankfully the house is cozy and warm, just in time for this wicked cold wave! As senior citizens, we're grateful that Silvan will come through for us in an emergency (as they did in the big ice storm a few years ago when our power was out). Thank you, Tony! After a software update our Apple TV tanked, displaying an error message and referring me to an Apple support page explaining how to restore it. I tried to do it myself, but being a senior citizen without a shred of computer savvy, I botched it and was totally at a loss. Fortunately we contacted Carbon Computing, who sent Gavin to our home. Professional, friendly and competent, Gavin solved the problem well within an hour, and provided help on other small matters as well. We've come to depend on Apple TV (we watch classical and jazz concerts from all over the world) and love having it working again. Thank you, Carbon, and thank you, Gavin! We were expecting our granddaughter for dinner when we discovered a leak under our kitchen sink. Our usual plumber was unavailable, so or the first time we called New Canadian. Shendon Brown arrived the same day and discovered a crack in our old drain. Mr. Brown demonstrated and explained the situation fully to us in an informative, consumer-friendly manner before replacing the drain. Thank you, Shendon! We're very pleased to be New Canadian customers for our future plumbing needs. Hi David, thank you for your feedback on our services. We are very pleased to know that you were satisfied with our efficient workmanship and customer service. Please keep in mind that we are here to assist you with any future work or inquiry that may arise and we appreciate any and all referrals that you make on our behalf. Once again, thank you for choosing New Canadian Drain & Plumbing and we look forward to your continuing business. Until next time David, take care. For the last few years we've used Public Plumbing for assorted plumbing jobs around the house, and we're highly satisfied. Vlad is is professional, prompt, and courteous - and the rates are quite reasonable. We have no hesitation in recommending Public Plumbing to any householder in Toronto. Hello David! Thank you kindly for taking the time to leave us a review. We appreciate your loyalty to the company and will be sure to pass on the kind remarks to Vlad. We are grateful for your recommendation and if you have any issues down the line, don't hesitate to give us a call! This was expensive because the house is 100 years old and layers and layers had to be removed, and wood had to be replaced before the roofing could even begin. Even our neighbours commented on how supportive this team was of each member...and polite, clean, efficient...a pleasure to work with. Luc was the roofer we used back in 1980 when we first bought this house. His son Ben now heads up the crew and is as honest and generous as his father. We had a number of household electrical jobs that had been accumulating over the years - outdated outlets, closets with pull-cord lighting instead of on/off switches, etc. - plus we needed a special floor outlet installed in our living room. Casey did a terrific job. He is punctual, pleasant, and thorough - with attention to detail and safety - and his rates are quite reasonable. One more thing: when you call this company, you get a human being on the phone, not an answering service. Thanks, Casey - we're Wattcom customers now. I truly appreciate your time in reviewing the Electrical Work performed, and I am proud to call you one of our customers. Thanks to Bill and his team for doing such a neat, quick and professional job. Over the years we've had bad experiences with eavestrough companies. Happily we've now found one we can trust: Rapport does quality work, with no unpleasant surprises. Next summer we want to add a retractable awning to our back patio - turns out Rapport does this, too. Thanks, Bill - we'll call you next summer! We've been using Luc's Roofing since we moved into this house in 1980 and he has earned our enthusiastic recommendation. Last December we incurred roof damage during the ice-storm. Our power was off and we were out of our house for eight days. The insurance company sent a contractor who told us that, in order to repair our roof, our power would have to be shut off for seven days while we stayed at a hotel. 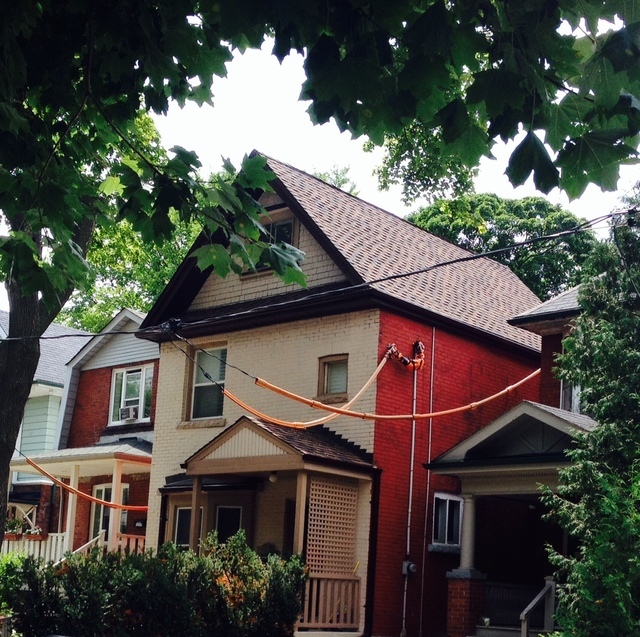 Ours is a typical downtown home, with narrow laneways. This other contractor said it was an incredibly difficult, unusual and complex job, and that our neighbour's laneway would be filled with debris for seven days. This was nonsense and unacceptable to us. 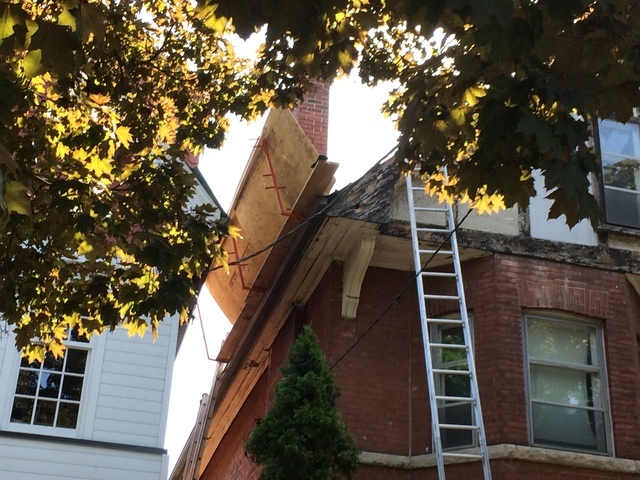 Fortunately we turned to Luc, who knows about close-together downtown homes and uses a special scaffolding system to prevent debris from falling down into the laneway. (See photo below, left.) Ben and his team were terrific, installing our new roof in two days. (See photo below, right.) The guys were hard-working, friendly, efficient, and quiet. Best of all, they cleaned up meticulousl, without disturbing a single flower in our garden. When they were finished, the laneways were cleaner than they were before the job! A great team! For anyone who needs roofing work, we recommend Luc's without reservation. Thank you, Luc! Hi David, we thought you'd been through enough already and were very relieved that we were able to get your job done properly and keep you there at the same time! Thanks for the vote of confidence. Aida and Simone did a fabulous job! They're friendly, professional, and extremely thorough. When they were done, our home was spotless! I have no hesitation whatever in recommending them. We'll be using this service regularly.